The second 2012 release of the America the Beautiful Five Ounce Uncirculated Coin™ series is the 2012 Chaco Culture Silver Uncirculated Coin. The reverse of this strike features a design emblematic of Chaco Culture National Historical Park found in the state of New Mexico. Like all other strikes of the America the Beautiful Five Ounce Series, each of these coins are struck from five ounces of .999 fine silver to a diameter of three inches. The series is considered the numismatic versions of the US Mint's America the Beautiful Bullion Coins which also feature similar specifications but are struck for investors whereas these uncirculated coins are intended for collectors. Aside from their intended markets, the two series also differ slightly in their appearances as the uncirculated coins showcase a 'P' mintmark indicating they were struck at the US Mint's facility in Philadelphia. The bullion coins were also struck in Philadelphia but contain no mintmark as is standard for US Mint bullion products. Chaco Culture National Historical Park of New Mexico was created to preserve one of the densest and best preserved examples of ancient pueblo dwellings found in North America. The park consists of almost 34,000 acres located between the cities of Albuquerque and Farmington. This series, like the related bullion coins, are actually struck as extremely large versions of the US Mint's America the Beautiful Quarters® Program. As such, the obverse of each coin contains a portrait of George Washington on the obverse like those quarter dollars. The portrait was originally designed by John Flanagan and is surrounded by the inscriptions of UNITED STATES OF AMERICA, LIBERTY, IN GOD WE TRUST and QUARTER DOLLAR. 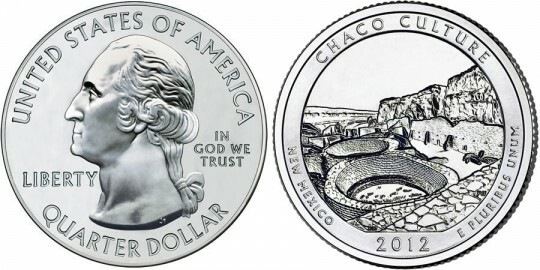 Shown on the reverse of the coins is a design emblematic of Chaco Culture National Historical Park. The design was completed by Donna Weaver and sculpted by Phebe Hemphill. According to the Mint, the design "illustrates a view to the west of two elevated kivas that are part of the Chetro Ketl Complex, the north wall of Chetro Ketl and the north wall of the canyon." Reverse inscriptions include CHACO CULTURE, NEW MEXICO, 2012 and E PLURIBUS UNUM. On the edge of each coin, "999 FINE SILVER 5.0 OUNCE" is inscribed.